Tree from Schuh (1979); and Schuh and Polhemus (1980). Carver, M., G.F. Gross and T.E. Woodward. 1991. Hemiptera (bugs, leafhoppers, cicadas, aphids, scale insects etc.). Pages 429-509 in The Insects of Australia. I.D. Naumann, ed. Melbourne University Press, Melbourne, Australia. 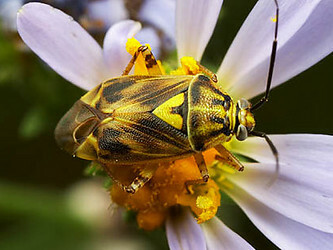 (Insecta, Heteroptera). Zoologica 48 (143): 1-302. Schaefer, C.W. 1990. The Hemiptera of North America: what we do and do not know. Pages 105-118 in Systematics of the North American insects and arachnids: status and needs. Contribution No. 3 to the National Biological Survey. Info. Ser. 90-1. Kosztarab, M., Schafer, C.W. . eds. Virginia Agricultural Experiment Station, Blacksburg. Schuh, R. T. 1986, The influence of cladistics on heteropteran classification. Annual Review of Entomology 31: 67-94. Schuh, R.T., C. Weirauch, and W.C. Wheeler. 2009. Phylogenetic relationships within the Cimicomorpha (Hemiptera: Heteroptera): a total-evidence analysis. Systematic Entomology 34: 15-48. Shcherbakov, D.E. and Y.A. Popov. 2002. Superorder Cimicidea Laicharting, 1781. Order Hemiptera Linné, 1758. The bugs, cicadas, plantlice, scale insects, etc. (= Cimicida Laicharting, 1781, = Homoptera Leach, 1815 + Heteroptera Latreille, 1810). pp. 143-157. In: Rasnitsyn, A. P.; Quicke, D. L. J. (eds.). History of Insects. Kluwer Academic Publishers, the Netherlands. 517 p.
Stys, P. 1996. Some groundplan characters of the Heteroptera. Pages 111-118 in Studies on Hemipteran Phylogeny. C. W. Schaefer, ed. Proceedings of Thomas Say Publications in Entomology, Entomological Society of America, Lanham, Maryland. Stys, P. and Kerzhner, 1975. The rank and nomenclature of higher taxa in recent Heteroptera. Acta Entomologica Bohemoslovaca 72: 64-79. Vasquez, M. and T. Lopez. 1999. 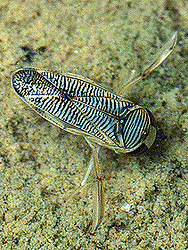 Filogenia de Heteroptera (Phylogeny of Heteroptera). Boletin de la SEA 26:427-434. Wheeler, W.C., R.T. Schuh, and R. Bang. 1993. Cladistic relationships among higher groups of Heteroptera: congruence between morphological and molecular data sets. Entomologica Scandinavica 24:121-137. Wygodzinsky, P. W. and K. Schmidt. 1991. Revision of the New World Enicocephalomorpha (Heteroptera). Bulletin of The American Museum of Natural History 200: 1-265. Page: Tree of Life Heteroptera. True bugs. Authored by Dimitri Forero. The TEXT of this page is licensed under the Creative Commons Attribution-NonCommercial License - Version 3.0. Note that images and other media featured on this page are each governed by their own license, and they may or may not be available for reuse. Click on an image or a media link to access the media data window, which provides the relevant licensing information. For the general terms and conditions of ToL material reuse and redistribution, please see the Tree of Life Copyright Policies.